There are simple ways to improve drainage in domestic situations. Surface water flooding can cause great damage to your property, so considerations should be given when planning driveways and patio areas. Surface water flooding occurs from excess rainfall and can come from sewers, drains, land runoff, groundwater and small watercourses. Correct planning is essential to make sure you protect your property from flooding, even if you aren't building in an area identified at risk of flooding. 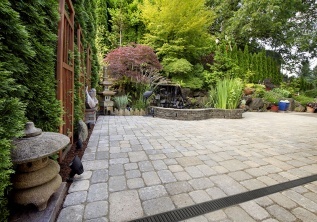 When you incorporate drainage products into the design it actually enhances your project, as well as avoiding flooding. You'll find the most common places drainage is needed are at garage thresholds, on patios and paths, as part of landscaping and on a larger scale, on pedestrian precincts and car parks. Surface water drainage solutions have to be able to withstand heavy foot and vehicle traffic but that doesn't mean you need to compromise on style. The looks you can achieve vary wildly, from elegant to cool and contemporary. Different finishes on drains will wear at varied rates and might need more maintenance. Consider where you are willing to compromise and check if the product you are buying has a guarantee.